Ear Plugs for Sleeping - From simple foam and reusable plugs, to moldable silicone or wax (highly recommended), to professional lab full custom molded plugs, sleeping ear plugs are the simplest and most effective solution for getting a good night's sleep. Snoring Relief - Our most powerful solutions for sleeping with serious snoring. Sleeping Earphones - Block out unwanted noises with your favorite music while you sleep. We even offer a selection of eye masks and other sleep aids to help you get the restful sleep you need. 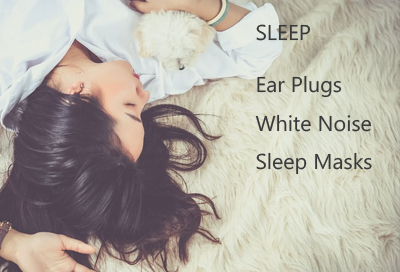 Browse the categories below to find the perfect sleeping solution for you. We offer the world's largest selection of ear plugs for sleeping and snoring. If you need help choosing, just email us at info@earplugstore.com. Our friendly staff will help you choose the best products for you and your family. While a pair of foam ear plugs plus a white noise machine on the bedside table is one of the most successful (and simple) strategies to get relief from snoring, your unique snoring problem may call for a more advanced solution. You will find our most powerful solutions for getting relief from severe snoring here. White noise machines are a proven tool to help you sleep more deeply, wake less often and get better rest. White noise is safe to use and has no side-effects. Use white noise to safely mask snoring. Combine white noise with ear plugs for superb peace and quiet. Got Ears?® Personal Isolation System™ is the only system specifically designed to provide complete isolation from bothersome noise, whether you are trying to concentrate in a hectic office, at home with noisy kids or neighbors, out in your backyard next to a highway, traveling on a plane, trying to sleep in a hotel room, or trying to study or sleep in your dorm room. If you like to listen to music while you drift off to sleep, then earphones for sleeping are exactly what you need. We also offer pillow speakers as another solution for comfortable nighttime music listening. Our sleep aids include sleeping masks, alarm clocks you can hear over bedside white noise, and an ear pillow that lets you comfortably sleep on your side even while wearing ear plugs.